Now in our 11th year, the Abington Community Garden was built with donations from community leaders, businesses and organizations. Run by volunteers, the garden is a program of the Abington Area Joint Recreation Board. 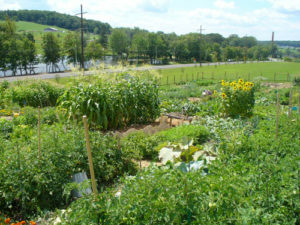 Thank you for your interest in the Abington Community Garden at Hillside Park. The 2019 application process is NOW open for NEW gardeners. Please note that applicants will have to read and agree to the Garden Rules and Regulations. The Community Garden relies entirely on the volunteer efforts and the commitment of its members to keep growing, it’s important that you understand the terms and expectations of garden membership before applying. Contact abingtoncommunitygarden@gmail.com if you need additional information. Garden members show their appreciation to the community for its support, donating excess produce annually to local food banks, senior centers and animal rescue organizations.